Coping with the aftermath of a fire can be chaotic for anyone, but for a business owner it can be even more stressful. The first instinct is to clean up and get back to the daily operations of running a business. Unfortunately fire damage clean up can be a very involved, and complex process. SERVPRO helps businesses get back to the normal day to day operations by efficiently and quickly cleaning affected structure of the building and processing the fire damaged materials. SERVPRO's fire clean services include: Pack out, cleaning and storage of affected contents in our warehouse until the fire clean out is complete. Structural cleaning of business including soot removal, deodorization, ozone, cleaning walls, ceilings, floors, fixtures, air ducts, and hard/soft surfaces. Cleanup of fire damage is not the job for a do-it-yourself property owner. The entire process can be very overwhelming for a homeowner, and SERVPRO is here to help! Its important to remember that while physical damage is obvious, the odor and soot clean up is difficult. Different fire sources require different cleaning procedures to return a residential or commercial property to its preloss condition. Restoration of a property can be very complex and proper smoke and odor removal are tasks that require experienced technicians that are certified in these specific areas. All of our technicians are IICRC certified and have studied the best techniques to restore your home! Don't wait or try to handle this damage on your own, call your fire specials at SERVPRO! Store oil, gasoline paints, propane and varnishes in a shed away from the home. Plug only one charging appliance into an outlet at a time. Don't use an extension cord when charging an appliance. If you experience a garage fire let SERVPRO help you! Our team is certified, trained and prepared to bring your home back to like, "it never even happened!" Whether the power is out, a storm has hit, a fire has start or water damaged has hit- when catastrophe strikes a commercial business, the damages can be crippling and put the day to day operations to a halt. Every hour spent cleaning is an hour lost of productivity and revenue. Let SERVPRO of Greater Highland/White Lake help you! We have highly trained professional technicians here 24 hours a day, 7 days a week, 365 days of the year available to properly and efficiently mitigate the damages. SERVPRO also offers the Emergency Ready Profile (ERP) a useful tool used to prepare a business for the "worse case scenario." The ERP data is a collection source of all of the most important phone numbers, and information you would need in the case of an emergency. Michigan is known for our harsh winters with extreme temperature drops. This means homeowners are susceptible to frozen pipes. Water expands when it freezes- putting additional pressure on the pipes, which can ultimately cause them to burst. Pipes that freeze are those that exposed to extreme cold, such as exterior spigots, water sprinkler lines, and water supply lines in unheated areas. Basements, craw spaces, attics and garages often have exterior pipe lines as well. To aid in freeing pipes make sure to keep your home to at least 55 degrees or warmer and leave interior doors open to increase air flow into the cooler areas of the home. If you experience frozen pipes make sure to call SERVPRO of Greater Highland/White Lake. We are available 365 days a year to help you! Inject-dry floor drying system is used to dry hardwood and ceramic tile flooring. It directs airflow down along the floor, drying floors faster. With proper placement of the mats it easily adapts to any floor plan. Placing a containment or "tenting" the affected area is sometimes used in conjunction with the inject-dry floor drying system. Evaporation will occur when the water moves from a liquid state to a vapor state in the air. This is achieved by rapid and direct air flow. Evaporation does not remove the moisture, it just moves it from the materials to the surrounding air. Dehumidification is the removal of moisture in the air. In some cases a containment is placed over an affected area ceiling to concentrate the dehumidification specifically on this area. Mold in homes can happen under many different circumstances. It could be an outside water intrusion, a flood, or sewer leak. It also could be from a bat, bird infestation, a decaying animal or rodent. As soon as you are aware of mold in the home its important to call someone for proper removal to make sure there are no effects your you heath or your loved ones. There are thousands of types of mold and depending on your location, temperature (inside and outside) will determine how to handle the home. First, its important to figure out where the source of mold is coming from and start the removal process. Call SERVPRO of Greater Highland/White Lake to help you out! We can walk you through the process, and get your home back to the safe environment it should be! Here is a photo of mold growth, prior to SERVPRO coming into the home for proper removal. Mold can happen in any home at any time! 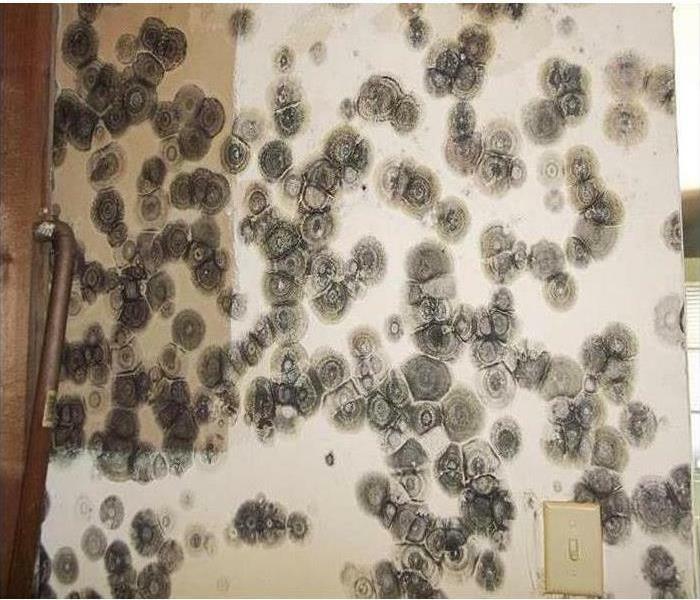 This picture is of some of the mold that was found in a summer home. When the homeowners winterized their home, they didn't think that a radiant heat line would split. This caused a large amount of water damage resulting in extreme mold throughout the property. The homeowner called SERVPRO of Greater Highland/White Lake to come in. Our technicians removed all the affected flooring and drywall and encapsulated the structure so the reconstruction can begin. The homeowners were thankful for our crews, and gad we were able to help speed up the reconstruction process. When you leave your home for long periods of time its important to properly prepare the home, but to also have a trustworthy family member to check on the home as well. Here is a photo of secondary damage, mold growth after water damage that wasn't handled properly. When SERVPRO of Greater Highland/ White Lake receives a call about water damage, our first goal is to handle the water loss. When working on removing dry wall, and working on the drying process our crews will often find secondary damage, mold in the home. The mold can occur from the water loss, or it could have been their prior to and when working it reveals the mold. 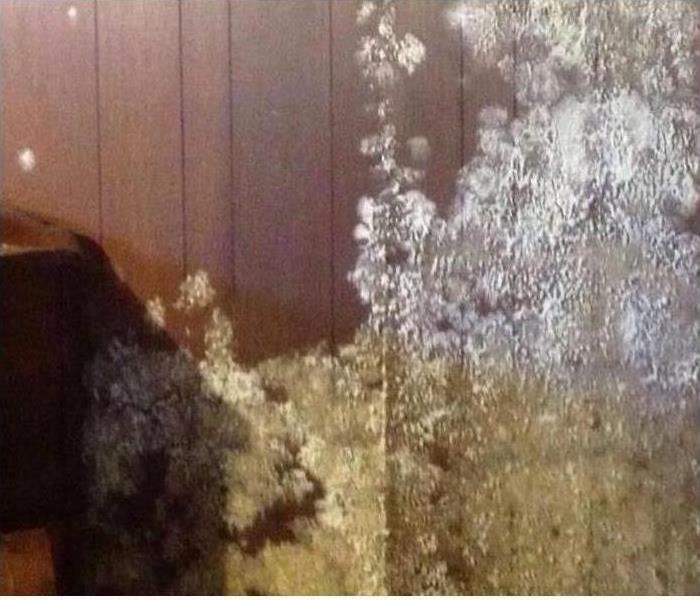 When this happens, SERVPRO of Greater Highland/White Lake is prepared to help the homeowner with the mold problem. Our production teams have been through IICRC training, which provides our crews with the ability to identify the mold, and take care of the problem. 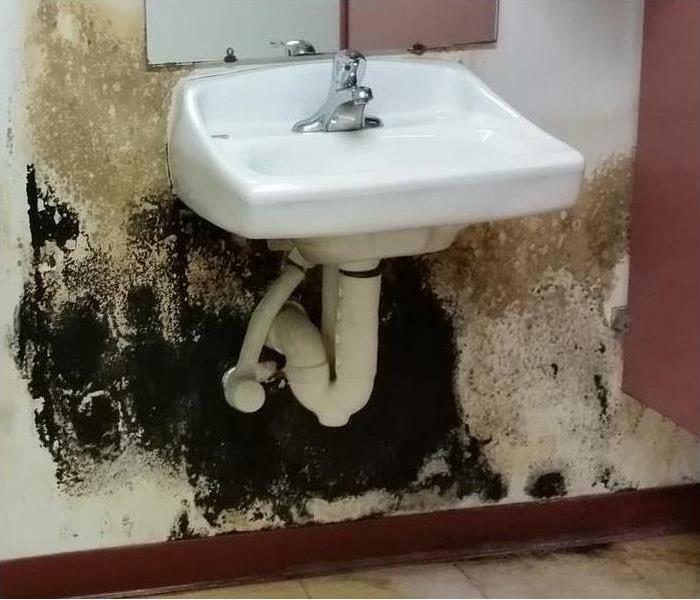 Let SERVPRO of Greater Highland/White Lake help you with your water loss and mold remediation! Mold can be harmful to you and your families health. If found, contact SERVPRO for properly remediation. Unfortunately, mold has no boundaries. For a significant amount of mold growth to occur, there must be a source of water (which could potentially go unnoticed) a source of food, and a substrate capable of sustaining growth. Most buildings contain plywood, drywall, carpeting, and carpet padding, as well as the building's furniture itself are considering "food for molds". After a single incident of "water damage" has occurred and left unmitigated, mold can grow inside the walls and then become dormant until a subsequent incident of high humidity. The right conditions can activate mold and could potentially have devastating results including substantial damage to the home and could cause people living in the home to have adverse reactions. Its important to call trained professionals if you discover mold in your home or business. Call SERVPRO Greater Highland/White Lake!